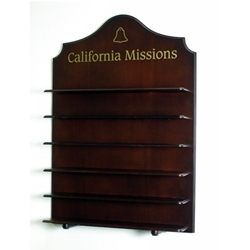 Designed for the "Cameo-sized" missions, this beautiful hand-crafted stained-wood wall unit displays all twenty-one historical missions, and their point-of-purchase plaque. The display features two hooks on the back to accommodate the unit being hung on the wall. The display is also designed for standing upright as there are wooden "feet" on the bottom shelf. The empty display weighs about 7 pounds.